How about showing me something Apple actually invented... They are masterful at taking other people's ideas and making them better. Not so far...but thanks for pausing. This is not fun for me either. I see the dynamic changing somewhat. Traditionally companies like P&G reaped huge profit from selling commodity products for premium prices taking advantage of human nature's lack of critical thinking in most routine decision making. I have long bought store brands whenever available but their popularity seems to be increasing recently. The $5M superbowl ads are almost a list of products not to buy, to reward that manipulation. They don't make rational sales pitches but subliminal arguments... (like corn in other brands of beer is bad, etc). It is exceedingly easy to scan for wrongdoings to remind us we are not done ushering in a world of peace. Easier still to be sarcastic about calls to appreciate how far we've come. Harder is to hold an idealized picture of the world that animates the desire to moralize, and temper it with historical reflection, which is nearly limitless in instructing us that, taken as a whole, our quality of life has improved beyond the wildest dreams of generations past. Everyone wishes universal peace would arrive at a faster pace. Being impatient for it does not mean we need to make a darkness out of present circumstances or use some horror of the day to distract from appreciating our present place in history. There is both much to be thankful for and much to be worried about. Terrible argument. 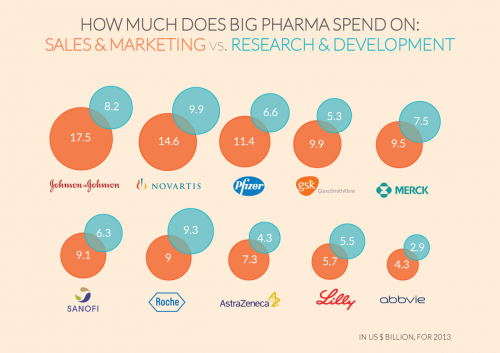 Big Pharma in the US spends way more on marketing and advertising than they do on R&D. Simply banning direct to client advertising could slash prices with no effect on research budgets. New drugs are also already partly bankrolled by taxpayers through government research grants and public labs, not drug revenues. Just one more example of corporate welfare (= socialism) being peddled to americans as a free-market success story. I agree with this 100 percent. All of it. I'm not really sure that's a comfort - when a person is at that level of poverty, barely making it, the stress is through the roof. Kind of like saying, "are you enjoying the music" to the folks on the deck of the Titanic. Sure, the overall standard of living is higher - great! But there's a long way to go before it even approaches OK to be in this situation. It's all relative, some people will never be happy. Politicians capitalize (funny word in this context) on this natural distribution of wealth to gang up on the far fewer wealthy (an inherent flaw in simple democracy and why we have enumerated rights in the constitution to avoid the tyranny of the masses.). If you believe politicians can change this with legislation, I have some nice dry land here in MS tonight. I can sympathize with the analogy, except for the part where our ship sinks to the bottom of the ocean. What rescue ships could handle the emergency? Very true, some will never be happy. And I don’t think any current political system will change anything. That’s the sad part. Hence the Titanic analogy. Well atleast picking up your mail is never a problem. That brick building across the street in that same photo is my post office, so I pick up my mail there... (until they close it down). The PO service has deteriorated... If I try to pick up my mail too early, my newspaper isn't in the PO box yet. The lady working there says I need to wait until after 9:30am to get my (morning) newspaper reliably (I asked). So they have trained me to pick up my mail later in the day, but too late on saturdays and they've already left the building, so no packages. I got notice of a package too big for my PO box yesterday so I'll have to wait until monday to get that from them. Back in the 70s my newspaper delivery service would drop the newspaper(s) around 6AM, and sometimes if I was still up and working I would read my paper before crashing. When I first bought this house (mid 80s), I could read the front page of my newspaper with my morning coffee and still be in my office at work several miles down the road by 8AM. Now sometimes the newspaper shows up days late, how many days later depends on where along the several delivery steps they dropped the ball. Sometimes just one day late sometimes 3 days late, so not just a decline in my local service. PS: That was maybe a once a year rain storm, but highest water level I recall since I've been paying attention. I cut that broad swale through my yard (with a bulldozer and backhoe) after hurricane Katrina, allowing water to flow from the back drainage system east of my property to the front system that pulls down lower out to the west. This was the first time in decades the water level in my yard was higher than the 3' diameter culvert draining that front ditch. The water out back rose to about 1" below my next door neighbor's floor level. His house used to get flooded almost annually before I cut that swale through my yard improving the local drainage. This was not a record storm, only 2 1/2 inches fell, but the rain came down pretty quickly on top of already saturated ground.